The Fargo 55000 DTC4500e single-sided ID card printer delivers high-volume performance with maximum security. Featuring ribbon options for varying needs, dual input hoppers, and built-in password protection, the Fargo 55000 DTC4500e single-sided card printer is designed for organizations that require robust, high-volume printing on a daily basis. The Fargo 55100 DTC4500e Dual-Sided ID card printer delivers high-volume performance with maximum security. 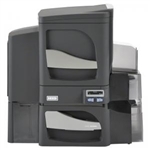 Featuring ribbon options for varying needs, dual input hoppers, and built-in password protection, the Fargo 55100 DTC4500e Dual-sided card printer is designed for organizations that require robust, high-volume printing on a daily basis. The Fargo 55400 DTC4500e Dual-Sided with Single-Side Lamination ID card printer delivers high-volume performance with maximum security. 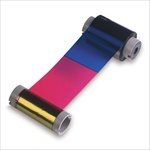 Featuring ribbon options for varying needs, dual input hoppers, and built-in password protection, the Fargo 55400 DTC4500e Dual-Sided with Single-Side Lamination card printer is designed for organizations that require robust, high-volume printing on a daily basis. The Fargo 55500 DTC4500e Dual-Sided with Dual-Side Lamination ID card printer delivers high-volume performance with maximum security. Featuring ribbon options for varying needs, dual input hoppers, and built-in password protection, the Fargo 55400 DTC4500e Dual-Sided with Dual-Side Lamination card printer is designed for organizations that require robust, high-volume printing on a daily basis.